Seriously, why are you so obsessed with us? America, we need to talk about sausage rolls -- these meaty pastry-wrapped treats are almost considered an Australian delicacy -- they're the perfect snack on a cold winter morning following a game of footy, and they're always the first to be snapped up when presented as finger good at parties. The one thing they're not, however, is an American invention (to be fair -- they're not even exclusively Australian but we like to claim ownership anyway). So just imagine the surprise outrage felt by lovers of the sausage roll when American grocery chain Trader Joe's boasted that they had taken the "classic dog-meets-dough pairing to the next level", swaddling sausage in "a perfectly flaky-when-cooked puff pasty". They even recommend dipping them "in your favourite condiments" including tomato sauce (surprise, surprise). "We don't mean to hot dog here, but this marriage of beefy and buttery is pretty genius," the website reads. Indeed, the marriage IS "pretty genius" Trader Joe's, that's why Aussies and Brits have been enjoying this dish for decades -- you can even pick one up at the petrol station when you're feeling a bit peckish -- they're honestly everywhere. As one would expect, people aren't taking the news too well and are venting their outrage on Twitter in hilarious tweets. 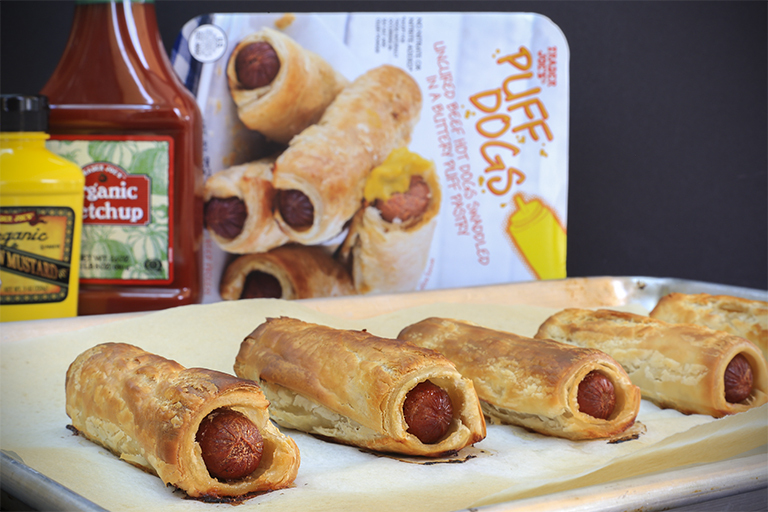 America has "invented" the sausage roll and called it a puff dog. Electing Trump as president is one thing but this just takes the biscuit. The Americans think they have invented something called a Puff Dog.